Steeping on the success of the PL041TQE, the PL041TEM has an added brew pressure gauge as well as different operational switches on the front panel. 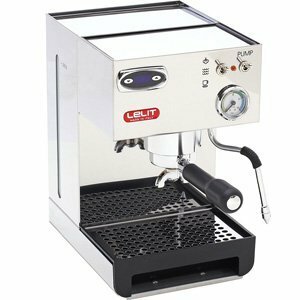 Purchase Lelit PL41TEM Espresso Machine – PID with gauge (D612) at Discounted Prices ✓ FREE DELIVERY possible on eligible purchases. PID boiler temperature controller allows temperature of the boiler to be programmed for different coffees. 1000 watt heating element for quicker reaction time when cold water enters the boiler. External manometer, or brew pressure gauge, to check in real time the brew pressure created by the resistance created by the coffee grind fineness, the tamping pressure, and the amount of ground coffee in the basket. Professional multi-directional steam wand that enables you to prepare creamy cappuccinos. 250 ml brass boiler helps keep a constant water temperature and facilitate the espresso coffee extraction. Please note that during an espresso extraction, the incoming cold water will reduce the temperature in the PID display. This is normal.